Sudakshina Bhattacharjee (née’ Mukherjee) was born and raised in west London till the age of 12 and then she had moved to Kolkata (Calcutta), India, for further schooling. She then came back to London and graduated with a BA (2:1) Hons in New Media Journalism with Film & TV Studies from Thames Valley University(now known as University of West London) between 2002-2005. Since then she has worked in several jobs in the print and online media, finance and education sectors. 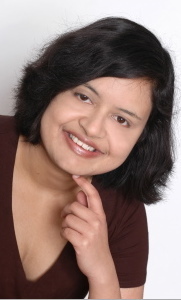 Till April 2011, Sudakshina has been a lecturer in journalism and psychology at various educational institutions in London. She then got married to a dental surgeon and lives in London, UK and Kolkata, India. Along with her lecturing commitments, Sudakshina is also a freelance journalist and a published poet. Sudakshina has also co-authored a book titled: Improve Your Global Business English: the Essential Toolkit to Writing and Communicating across Borders (Kogan Page, November 2012) which helps professionals in improving their business communications in today’s digital age. You will find published articles, essays, poetry by Sudakshina showcased here: –https://sudakshinakina.wordpress.com .